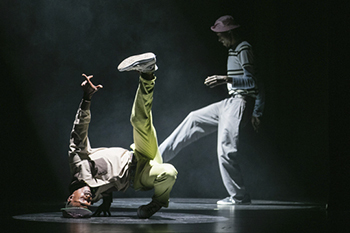 Sadler’s Wells’ critically acclaimed international festival of hip hop dance theatre, Breakin’ Convention, is back, with performances from UK and international companies and crews. Now in its 14th year, this hugely popular Sadler’s Wells Production is once again hosted and curated by Associate Artist Jonzi D. Following the annual festival at Sadler’s Wells over the May bank holiday (Saturday 29 April - Monday 1 May), Breakin’ Convention will then tour for a second consecutive year, to nine venues across the UK throughout May until early June 2017. The London festival from Saturday 29 April - Monday 1 May sees Sadler’s Wells’ foyer transformed with live DJs, freestyle dance jams, graffiti exhibitions, workshops from top international artists and live aerosol art. The participatory activities take place pre-show and during the interval. For the fourth year running Breakin’ Convention takes it back to the roots of hip hop on bank holiday Monday 1 May with Park Jam, an outdoor party suitable for all the family in Spa Fields Park.